I'm thinking about setting up an outdoor kitchen this year, do you have one? I love the idea of prepping food outdoors, and setting up a little makeshift cooking space. So fun to do! I posted about one a few years back and keep thinking about it. (I love this kind of stuff). 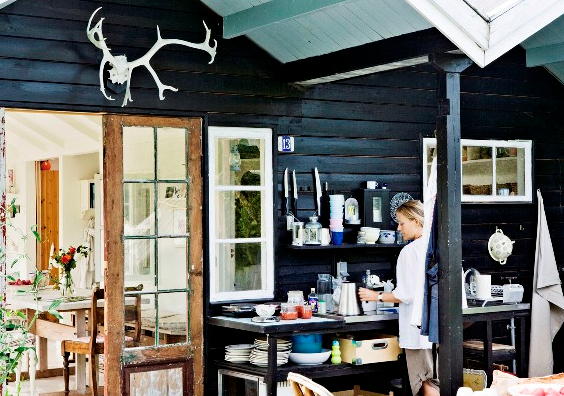 Above photo: Villa Else, Katrine Martensen-Larsen Stylist/Writer. Photograph: Stuart McIntyre From kmldesign.dk. I posted some ideas today on Babble. Click here to see my post. Yes I have thought about an outside Kitchen. The first house we ever bought was a row home off an old Italian couple and they has a second kitchen in the basement from which you could just step out into the back garden. They would do all their canning there. But an outside one to entertain would be fun. I don't have out door kitchen. Because there are some disadvantage that's why i don't like to do this. first one is the dust. if i make kitchen out side the door i must clean every plate every spoon even anything that i have in kitchen even i am not using it.